For the second time this season, the Phoenix Suns have gotten rid of their leading scorer. The first time occurred before the season started, when they let Amar’e Stoudemire go to the New York knicks because he was asking for too much money. This time, they traded their leading scorer, Jason Richardson, along with Hedo Turkoglu (acquired on July 14th) and Earl Clark to Orlando for Vince Carter, Marcin Gortat, and Mickael Pietrus. The Suns will also get Orlando’s first round draft pick for 2011 as part of the trade. Twenty-five games into the ’10-’11 NBA season, it looks like the Phoenix Suns are looking past this year and towards the future. The Phoenix Suns were sitting at 12-12, and just took a beating at the hands of the Dallas Mavericks, losing by 15 points, 91-106. Steve Nash suffered a minor injury in the first quarter and Jason Richardson only scored 12 points that night on December 17th. The Suns, then 12-13 seemed destined for a .500 season, and a season-long battle to make the 2011 NBA Playoffs, but nobody was expecting a trade of this significance. Since the trade, the Suns have gone 2-5, and include losses to the Los Angeles Clippers (10-24), Philadelphia 76ers (13-20), and Sacramento Kings (7-24). Their only substantial win was against the Oklahoma City Thunder (23-12) 113-110 on December 19th, the day after the six player trade, and before the new players in the trade were added to the Suns. This was a night where Grant Hill scored 30 points (and 11 rebounds), something he had not done since February 27, 2005. So now let’s look at what the Suns gave up, and what they got in return. The Phoenix Suns gave up their leading scorer in Jason Richardson. He was averaging 19.3 points per game, and 4.4 rebounds per game. They also gave up on the Hedo Turkoglu project, which only lasted 25 games. He was averaging 9.5 points, and 4.0 rebounds per game. The final player in the trade was Earl Clark, who had been put into action when Robin Lopez went down with an injury. He was not really playing for the Suns in only his second year in the NBA, averaging a mere 3.2 points and 1.9 rebounds and 8 minutes per game in the 9 games he played. 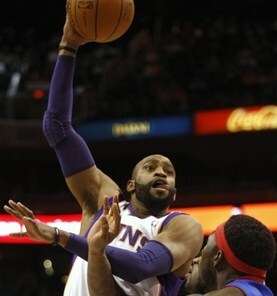 Vince Carter, Marcin Gortat, and Michael Pietrus were the three players the Suns received from the Orlando Magic in this trade. Vince Carter is soon to be 34 years old, and has been in the NBA since 1998. He has a career average of 22.7 points per game. He obviously will be the replacement for Jason Richardson, and they have very similar career stats as you can see below. They were both drafted as the fifth player in the first round by the Golden State Warriors, and both have birthdays in January. They are both 6-6, are within 5 pounds in weight, and play the same position. However, if you look at what they have done before the trade this season, you will see a very different story. Vince Carter and Jason Richardson have gone different ways this season. Vince Carter is taking 6.4 fewer shots per game, has a lower 3 point shooting percentage, is shooting fewer free throws and has a lower free throw shooting percentage, and is averaging 7.6 fewer points per game. Jason Richardson is averaging more 3 point shots and a higher 3 point shooting percentage, as well as a higher free throw percentage, fewer fouls per game, and 1.1 more points per game than his career average. Vince Carter has definitely lost a step over the years, but I’m not sure you can say that about Jason Richardson yet. Vince Carter had averaged as much as 26.7 points per game early in his career, but since the ’06-’07 season, his points per game has gone down each year, from 25.2 to 15.1 (with Orlando this year), a drop-off of over 10 points per game in five years. Jason Richardson is still going strong, as he has never averaged more than 23.2 points per game, and was averaging 19.3 points per game with the Phoenix Suns until the trade. In regards to defense, which I know the Suns need, I would choose Jason Richardson over Vince Carter all day long. Marcin Gortat is a 6-11 center that also came to Phoenix in the trade. This is only his third year in the NBA, and he has not had much of an opportunity to play sitting on the bench behind Dwight Howard. The Suns, as well as other NBA teams, feel that Gortat has potential and the greatest upside of all the players in the trade. He has a high shooting percentage of .549, but his free throw percentage of .645, and 4.34 rebounds per game are sub-par for a starting center in the NBA. Not enough is known about his abilities yet, but the Suns are obviously looking to find out, as Gortat has been averaging more than twice the playing time of the Suns starting center Robin Lopez since the trade. I personally am not going to hold my breath that he is going to turn out to be a premier player in the NBA. 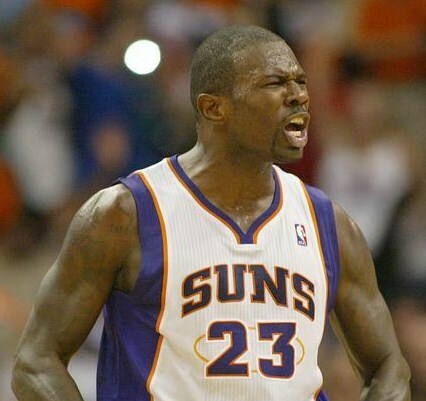 The third player to come over to the Suns in the trade was Mickael Pietrus. He is a 7 year pro who has been a journeyman up to this point in his career. He is a 6-6 forward who has already show enough talent to work his way into the starting lineup with the Suns according to coach Gentry, although the Suns starting lineup seems to change daily depending on the weather. Pietrus is best known for his defense, which is a good thing because his shooting percentage of .433 would have him in the bottom 25% of the entire league. He does not shoot the 3 well either, averages only 3.2 rebounds per game, and has a free throw average of .667. He averages 8.7 points per game, and about 22 minutes per game. He has not shown any improvement in any statistics over his 7 year career, so what you see is what you get with Michael Pietrus. The Suns are giving up on this year and obviously looking to their future with this trade. They basically got two bench players, and a player that has seen better days in Vince Carter. This trade does give the Suns two first round draft picks next year. I see this trade as a plan for the future, and don’t see Vince Carter sticking with the Suns longer than this season. Time is running out for the Nash era, and if the Suns are not going to make a run this year, they had better plan to start making a run next year. ~ by Troy Erickson Realtor on January 3, 2011.